It’s exciting to fill that new house with special touches that say something about you. From the kitchen to the bedrooms, this is a chance to really express yourself. The new bath offers a perfect opportunity for designing personal space, so enjoy making it all yours. 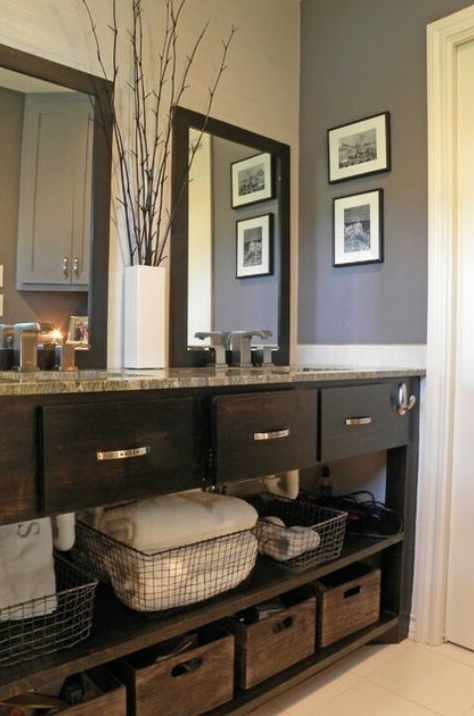 Here are five beautiful bathroom tips that are sure to brighten up this busy room. Overhead fixtures illuminate the bath, but they cast light downward and throw shadows that don’t really reflect your good looks. Take a tip from the movie stars, and install lights around the edge of the vanity mirror. From morning makeup to night time beauty treatments, you’ll see everything in a better light. Not only will this make you look better in the bathroom, it is also a very in style. It is not a standard in houses these days, so it will absolutely look like an extra you have added yourself, adding value and personality. Cover those bare walls with rattan or bamboo shelves filled with your favorite plants. All that greenery laps up the humidity when you shower, and it gives the room a lovely, natural appeal. Trailing ivy, dramatic spider plants and exotic orchids are beautiful choices for softening the edges around your bathroom. Replace those old fixtures, and put a little style in the sink. If you’re a traditionalist, indulge in elegant brass with an antique finish and finely carved detail. Create contemporary flair with the silver curve of stainless steel arched faucets featuring finger touch controls. New fixtures are a small change that you’ll appreciate every day. It is also an easy way to have a lot of impact of the room and give it a definite style and look. Just by picking the right hardware, you can covey a new look and feeling in those close quarters. Save the old shower curtain for drop cloth duty, and hang something truly chic. Today’s curtains feature lovely cotton and linen blends that add soft texture and personal style to the bath. Brighten up the room with a splashy floral pattern, or set a romantic mood with pretty voile ruffles. Replace that plain white fixture with a model toned in flamingo pinks or brilliant blues. Put charm the bath with an antique claw-footed replica, or install a contemporary tub styled like modern art. From deep tubs for soaking to asymmetrical shapes for drama, choose a tub you love. 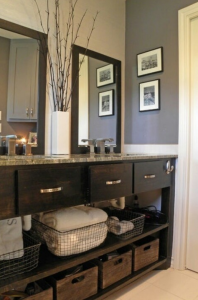 When you think about how much time you spend in the bathroom, it makes sense to create a space that you really enjoy. Throughout our beautiful state of Colorado, new homes present many wonderful decorating opportunities, but don’t overlook the potential in that bathroom. Whether you make it sing or turn it into a quiet retreat, it’s all yours, so let it say something special.